Olympia Mayor Shelby recently asked me at a Rotary meeting about my views on the minimum wage – was I for it or against it? I thought for a moment and realized that, in truth, my answer was mixed. My initial response was that an increase in the minimum wage might put some of the people we serve in the target zone in terms of getting laid off. But an increased income would be wonderful for people with disabilities who are often the lowest paid jobs. So it’s a conundrum for me. And I’m not the only one. Listening to NPR a few weeks ago as I was driving home I heard two economists (UMASS and Cal Irvine) with opposing views on this very subject. 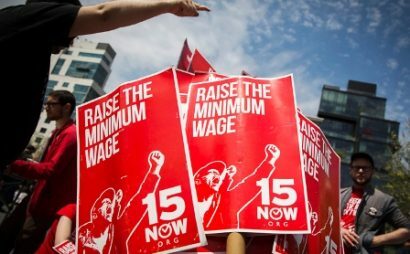 As with any research finding a control group is rather difficult but the Cal Irvine professor stated that minimum wage employees are in the margins in terms of education, experience, etc. and are the most vulnerable to labor market forces of all kinds. Both stated there would be an impact on some jobs – but that over time jobs return. My experience would echo this assessment. When the economy goes sour or when the state increases the minimum wage individuals with disabilities are the first to lose their jobs. But once both employers and the economy gets their equilibrium back, and with time, the jobs return. So on one hand I favor an increase to $15 per hour but on the other hand I fret about lost jobs for the individuals we serve. Additionally, while most of our workers earn more than $15 per hour we don’t start our employees out above that wage so I am concerned about the economic impact on Morningside as an employer too. In the end, wages will rise from one force or another so I believe preparing for it as much as possible and responding in a manner that enhances our overall economy and community is the duty of every employer.